Simply sign up to our mailing list below. 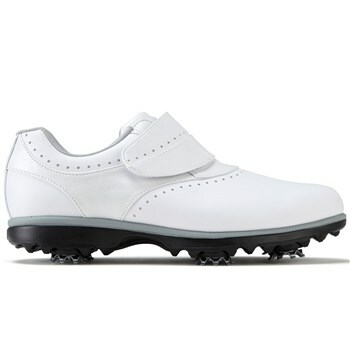 If you prefer cleated golf shoes over spikeless but want something seriously comfortable to wear on hard ground and all other underfoot conditions the FootJoy ladies eMerge golf shoes is a contender. Merging fun styling with cleated performance, eMerge ladies golf shoes provide great traction and easily maintain their beauty round after round. Built on the Natural Last they have a full rounded toe character, full across the forefoot with a standard instep and heel. The lightweight PillowSof™ moulded foam footbed provides awesome underfoot comfort. Full grain leather uppers offer outstanding waterproof comfort, breathability, and durability. FootJoy warrants that the ladies eMerge golf shoe will be waterproof in normal use for one year. The FootJoy eMerge offers great value for money and is a hard wearing golf shoe with a lightweight cleated performance for the everyday golfer. The Fast Twist™ Cleat System with Pulsar™ Cleats by Softspikes®, which are the number 1 selling cleat in golf and the overwhelming choice of touring professionals worldwide, provide stability and support from the moment you step foot on the course. Please see below for information relating to shoe sizing.